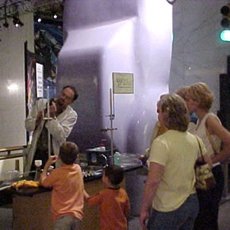 A materials matter demonstration of Nitinol at the Museum of Science and Industry (Chicago, IL). The Franklin Institute, named in honor of Benjamin Franklin, is a nationally renowned science museum located in downtown Philadelphia. Students, faculty, and staff in the MRSEC have been working with the staff of The Franklin Institute to design innov ative new educational resources. 20 copies of each kit have been fabricated and distributed to science museums nationwide. MRSEC researchers present the demonstrations at many outreach events and educational activities throughout the year. Each kit includes a set of interactive activities to be presented by a docent. Each 5-10 minute demonstration emphasizes a specific scientific concept, principle, or property. Visitors are engaged by relating these concepts to examples observed in daily life. Macroscopic models illustrate and explain the phenomena occurring within materials at the micro-, nano-, or atomic-scales. Materials Matter explores the "micro" mechanisms behind the unusual and surprising "macro" behavior of materials such as aerogels, shape-memory alloys, polymers, electronic ink, and zeolites. Zoom in on Life investigates how the nanometer sized parts of our body function in order to make life possible. Activities in this kit focus on antibodies, DNA, molecular motors, cell membranes, and vision. Small Wonders features everyday applications of nanotechnology. Activities include low tech applications such as invisible sunblock and antibacterial silver particles, as well as high tech stain-repellent fabric, cancer therapeutics, and materials for environmental remediation. Hidden Power focuses upon the conversion of various forms of renewable and developing energy technologies into electricity. Content includes material properties found in solar panels, batteries, thermoelectricity, piezoelectricity, and LED's, as well as the general concepts explaining steam turbines and efficiency. Pocket Tech (released in 2013) explores basic computing concepts and key technological features inherent in current, commonly-used hand-held devices. Smart-phones, donated by AT&T, are included in each kit to illustrate screen rotation, touch features, visual display structures, and signal transmission.